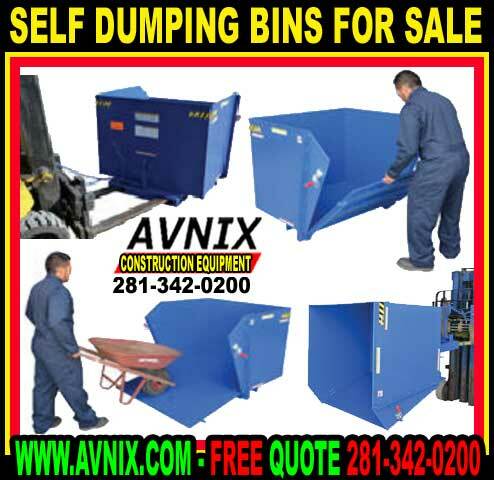 Avnix Forklift self dumping bin has a low profile design with a fold down front door for easy loading and unloading. The manual hand latches are used to lock the drop-down front door. The manual pull cable is used to dump the hopper bin from the cab of a forklift truck. Our self dumping bin returns to the upright position when lowered to the floor. 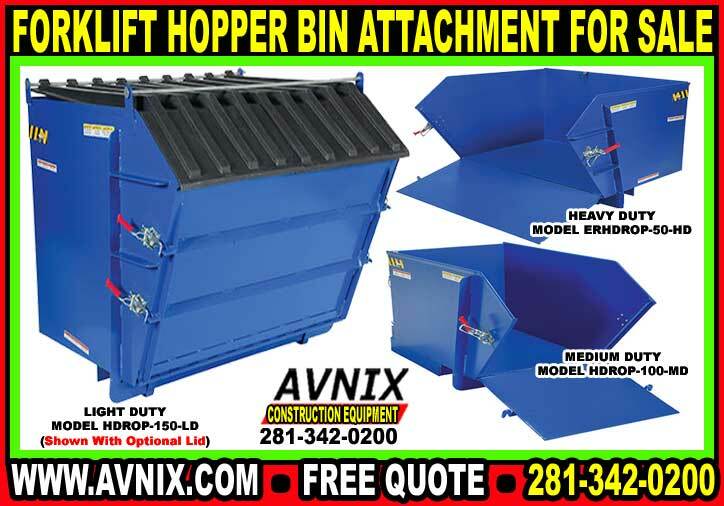 Forklift hopper bins feature full 90°dumping, steel construction, and a powder coat blue finish. Heavily Reinforced Fold Down Front For Easier Loading And Unloading. Heavy-Duty Formed Base Chained To Fork Truck. Ramp May Be Lowered And Easily Loaded & Unloaded. Easily Loaded & Unloaded With Wheeled Carts. When our self dumping bin hits the factory floor, a forklift is ideal for moving all kinds of materials like dirt, rubbish top soil, trash or small parts. For this type of job, the solution is a forklift attachment like a self dumping hopper bin. There are numerous uses for a forklift hopper bin attachment, many warehouses and industrial plants have more than a few on hand. Some forklift hopper bins will be put to use every day, while others will be stacked out of the way until they are needed. During the day, personnel inside a warehouse are generating a lot of waste. In one industrial plant, they might get along by loading a forklift hopper bin with paper, debris, dirt, garbage, trash or other waste and carrying them out by hand and dumping them into the waste receptacles. That solution works in a small workshop with just a few staff and very little waste. On the other hand, if a warehouse or commercial plant is big enough to need a forklift, it is also large enough to need at least one forklift self dumping bin attachment for waste disposal. The best forklift attachment for this reason is the self dumping bin hopper. A forklift truck is a major expense. Aside from the cost of the fork truck itself, the location it operates in will be fairly large and the amount of materials being handled will be equally large. It reasonable to assume that the amount of waste being generated will also be quite large. When a forklift truck is being used to its potential, the company may not need to hire extra workers. It only makes sense, then, to make another small investment in a self dumping hopper bin. Because of this, many companies try to get by without one. This is a mistake. If you add up the staff hours wasted by hand moving small amounts of waste material each day, it adds up to hundreds of hours per year at a minimum. If a forklift attachment that costs less than $1000 and will outlive your forklift and can save your company more than a thousand dollars in a single year, it makes economic sense to have one. When there is a forklift attachment like a plastic hopper bin inside the building, the waste can be discarded into it without disturbing the workflow. When hopper bin is full, the forklift driver picks up and carry’s the hopper outdoors to the waste area and discharges the load. Forklift operator doesn’t even have to get out of his seat. The work is completed in minutes and in many instances it only needs be done once a day. Truth is that every company that has a forklift ought to also think about what forklift attachment they need to boost production and save on employee costs. In a tight economy, everything counts.